Truffles make the world go ’round… at least these do! Last week, a friend gave us some homemade truffles, and they blew us away, so Jon decided to try his hand at making some. Of course, as with most recipes, we can’t go with the status quo. We have to push the boundaries and think outside the box, so we settled on Pistachio Covered Lemon & Lavendar and Cardamon & Chili Chocolate. There truly are no words. These truffles rock! Though a tad bit difficult to make, it sure was fun to see Jon standing in the kitchen with chocolate melting all over his hands wearing that “icky” face he makes (kind of like a kid who stuck his hand in mud and doesn’t know where to put it, so he stands there with a big frown, shaking his hands on the verge of tears)… yeah, that was the scene in the kitchen, but he powered through and the results were worth it. The Lemon/Lavendar truffles are by far my favorite and received the best reviews from family and friends during the holidays, but the Cardamon Chili are nothing to scoff at. Both are rich, creamy, mouth-watering and downright delicious. If you have some patience and are looking for a treat to truly impress, this is it. And I promise, you can do it. Heat the cream, butter, zest and lavender in a saucepan over hot water, until hot but not boiling. Add the chopped white chocolate and stir until it has melted completely and is smooth. Pour into a container and freeze for 3-4 hours. When set hard, use a melon baller or scoop to scoop out 1 1/2 inch balls and roll it in your hands to form perfect round balls. Here, we did two different things. We rolled half of the balls in chopped pistachios and refrigerated. For the other half, we melted the semi-sweet chocolate, dipped the balls in it and then sprinkled them with chopped pistachio. This recipe makes about 15 truffles. Heat the cream and butter in a saucepan, over hot water, until it is hot but not boiling. Take the pan off the heat and add the chocolate, cardamom and chilli powder. Stir everything till it is smooth. Pour the truffle mixture into a box and refrigerate till set well. Using a melon baller or scoop, scoop out 1 1/2″ balls and roll them in your hands (this will be messy). Melt the semi-sweet chocolate and dip the formed balls, sprinkle with chili powder. Refrigerate till ready to serve. This recipe makes about 25 truffles. 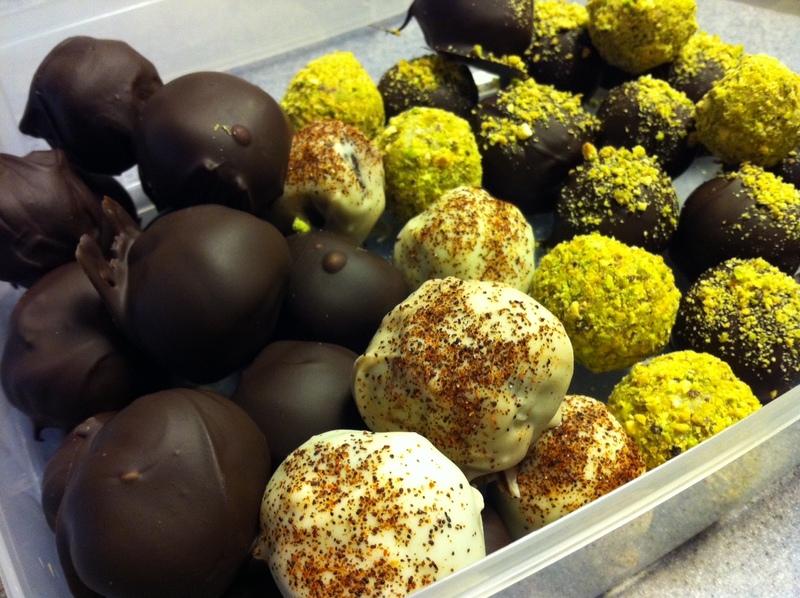 You will notice that we have some white chocolate covered truffles in the picture- we melted some white chocolate and dipped the Cardamon Chili recipe in white chocolate and sprinkled with chili powder. Before attempting to melt chocolate, we recommend that you do some reading about tempering chocolate. This is the process for achieving optimal texture and involves heating up and cooling chocolate several times before dipping. Jon recommends this VIDEO. Those sound and look really good. I’m not a huge fan of chocolate, I’ll eat it when offered, but wouldn’t go out of my way for it. Then last year my niece made me bourbon (Wild Turkey) truffles for Christmas and they blew my socks off. I’m sure the bourbon helped a lot, but they opened my eyes to other possibilities for chocolate. Makes me wonder about combining other liqueurs and flavors like orange and Grand Marnier, hazelnut and Frangelico, espresso and Kahlua. But anyway, your flavor combinations sound more interesting and creative than mine. Despite the chocolate it would be fun to sample some of them. The cardamon and chili combination sounds especially good to me and makes me wonder how chocolate and the smoky flavor of chipoltes would taste. Fun to read what creative and adventurous spirits like you and Jon are coming up with. Keep it up.